So Soros had lost $2 billion when the Russian Economy collapsed. With the dot-com boom in 1999, Soros lost $700 million when he bet the stocks would have a downfall and they didn’t. George decided to change his mind and buy into the stocks. That’s when the NASDAQ crash in Spring 2000 happened. Soros lost $3 billion. That’s when he “retired” from active involvement in managing the Quantum Fund. He didn’t retire, of course. George does what he wants anyway. What ends up happening is Soros turned his management fund into a family office in 2011. This was done to circumvent the Dodd-Frank regulations Obama signed into law in 2010. By 1996 and the start of the Clinton era is when George Soros became involved within the United States. The Open Society targeted drug laws, the criminal justice system, immigration policies, and end-of-life care. His “harm reduction” strategy was curtailing law enforcement’s war against drugs. They did a lot through the Open Society’s funding of the Drug Policy Alliance. Currently on a $50,000,000 grant for the next five years (it was a 10-year grant that started in 2012). Soros saw the Twin Towers fall in 2001. He told someone in an interview the event “touched” him. At first, he backed the strikes against Taliban forces in Afghanistan. George thought America was heading the wrong way when the Patriot Act passed. This was on top of Bush’s invasion of Iraq. Soros had a go at trying to get Bush out of office in 2004. $23 million went to help John Kerry. While I hated Glenn Beck growing up, I came across one of his old shows he did back on FOX News. The one with the chalkboard and the strange over-dramatic theatrics. My personal belief is Glenn Beck was hyperbolic when discussing Soros. Despite that, there were some decent insights and facts pointed out. We can apply this to the United States on a wider scale. 1.) Form a Shadow Government: Aryeh Neier was the first President of the Open Society Institute from 1993 to 2012. He had previously involved with the creation of Students for a Democratic Society back in the 1960s. A socialist organization dedicated to student rights activism. Their Weather Underground subgroup organized the infamous Days of Rage riots (October 8th to 11th, 1969). Soros funded 1/3 of the shadow conventions in 2000. It was a hodge-podge group of activists, politicians, and celebrities running “shadow conventions” to mirror the actual ones going on during that election year. John McCain was there. As well as Jesse Jackson. They focused on campaign-finance reform, the growing gap between the rich and poor, and the war on drugs. Arianna Huffington was his megaphone. Years later she’d involve herself with on the Directors Board for Soros’s Center for Public Integrity. It’s ironic. But we can take advantage of people’s perceptions of what’s considered left-wing and right-wing when it comes to media reporting. Much like how Soros uses that for economics. MOTHER JONES talked about these shadow conventions at the time. Aren’t they left-leaning? But McCain’s appearance at the Shadow Conventions would actually lead somewhere. In November 2002, he and Russ Feingold got the Bipartisan Campaign Reform Act passed. This McCain-Feingold Act put a prohibition on soft money (funds perceived to influence elections but not subject to campaign finance law regulations) in federal elections for political parties, officeholders, and other candidates. There was barring on unions and corporations using funds to buy issue-based advertisements. This would later change in January 2010 with Citizens United v. the Federal Election Commission. It deemed Section 203 of the McCain-Feingold act as a violation of the first amendment. But this 8-year time frame changed the political landscape. Issue-advocacy groups with 501(c)3 (plus 527 and 501(c)4) status were not included in the McCain-Feingold act. So, companies could donate to these 501(c)3 (or other aforementioned) groups instead, and let them speak on their behalf. Given the new artificial demand for them out of this McCain-Feingold law, there was a 501(c)3 (and other aforementioned groups) creation boom. McCain-Feingold 2002 led to 501(c)3 (and other aforementioned groups) boom, and that’s what Soros is a pro at controlling. 2.) Control the Airwaves: Open Society Institute donated $1.8 million to NPR. The NPR ombudsman actually talked about it when this was happening in May 2011. This was a two-year grant from OSI for their Impact on Government project and used to hire 100 journalists. NPR hired two radio reporters for every state to put more of a spotlight on state government issues. Soros donated $3 million to John Podesta’s Center for American Progress Action Fund. Another source cites OSI gave Center for American Progress over $5.4 million from 2005 to 2010. Established in 2003 as a counterattack against the Republicans and their Heritage Foundation. Podesta called it a “think tank on steroids,” meant to be a powerhouse for progressives. Podesta and the Center for American Progress oversaw the 2008 Obama White House transition. CAP was behind many of the attack ads against McCain’s policies in the lead-up to the 2008 elections. Coordinating with media outlets and pumping their talking points down their throats. The most important branch of this is the ThinkProgress “news” website. That labels itself as a forum for progressive ideas. In 2010, ThinkProgress accused the U.S. Chamber of Commerce of running Partisan Attack ads backed by foreign funding. This reminds me of leftist claims about Russia’s involvement in Trump winning 2016 election. The piece by ThinkProgress provided no evidence of this allegation. The Obama White House even confirmed that they knew of no specific evidence at that time. 3.) Destabilize the State: OSI funds the Tides Foundation. To be clear though, Soros did NOT establish the Tides Foundation. That honor goes to Drummond Pike, who did so in 1976. Tides is a middle-man charity. They receive donor money and then send it off to whatever political cause they desire. This comes in handy when it comes to radical groups. Allow me to better explain. Someone who wanted to fund radicals but not have their name attached? They could send their cash off to the Tides Foundation and let them donate it on their behalf. It’s a loophole that allows nonprofits to make for-profit groups and then fund them via Tides. By 2010, the Tides Center was overseeing over 140 projects. Tides sends money onto places like the Apollo Alliance. Their stated goal was to “catalyze a clean energy revolution in America.” But this Apollo Alliance group managed to have an impact elsewhere. They helped craft the $86 billion “clean energy and green-collar jobs” section of Obama’s $787 billion stimulus package law in 2009. A climate memo (PDF) indicates George’s devotion to the issue. Soros was pledging $10,000,000 a year for 5 years to the Climate Policy Initiative starting back in 2009. People accuse Wikipedia of having a left-leaning bias. $2,000,000 from Tides in 2010 might’ve caused that change of perspective for the site. Call it a hunch. Soros and Tides Foundation sometimes double-team on funding too. In 2012 the Daily Caller revealed records of Media Matters for America receiving $4,384,702 from Tides and $1,075,000 from OSI. 4.) Provoke an Election Crisis: OSI funded ACORN to shake confidence in the vote. The Association of Community Organizations for Reform Now makes up that acronym. They’re focused on getting as many people signed up to vote as possible, along with other social issues like gun control and health care. To get an idea of what the group was like, here’s a quote from one of their CEOs, Bertha Lewis. “Organize, get out into the street. You really have got to circle the wagons. This is not rhetoric or hyperbole. This is real.” ACORN closed after a scandal in September 2009. James O’ Keefe and Hannah Giles pretended to be a pimp and a prostitute, then asked ACORN staff how they can trick federal tax authorities. The incident led to a domino effect cascaded by questions about how ACORN used funds. The group closed in November 2010 after their government contracts and donors fled. Soros donated $10,000 to the Secretary of State project (SOS). The group’s intent was coaching and electing their own Secretary of States around the U.S. Which, as a reminder, are the people who certify election results. Founded in 2006, but hasn’t been exactly active since 2010. Group members believed electing Democrats in certain states was key to election protection. Targeting battleground states with tight vote margins back from the 2004 Presidential elections. It was a by-product of the organization Soros founded in 2005, Democracy Alliance. It’s better to show rather than tell you about this organization. With that in mind, here’s a map of their anti-Trump efforts courtesy of the New York Times. The group is a bunch of donors that coordinate their contributions to go to whoever they endorse. A great example of this happened in 2016 after Trump’s election. It was then Soros and the Democracy Alliance gathered in DC to discuss how to block actions throughout President Trump’s term. Nancy Pelosi, Elizabeth Warren, and Keith Ellison were among some of the folks who showed up. Soros further invested in the leftist platform of his Democracy Alliance to help support projects like America Votes. A 501(c)4 organization dedicated to coordinating progressive issues. 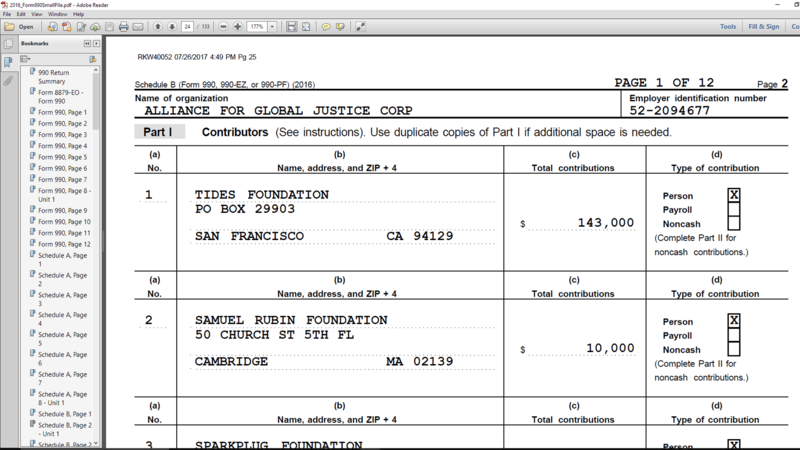 In 2012, Tides Foundation dumped $1.8 million during the election season into this group. 5.) Take Power — Stage Demonstrations: Institute for Policy Studies is another group Soros allegedly involved himself in. The oldest of these Think Tanks, a 501(c)3 founded by Marcus Raskin and Richard Barnet. 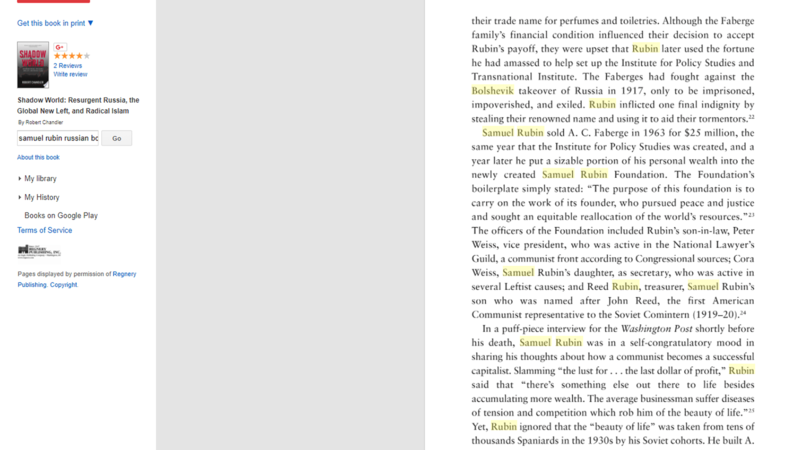 Their financial backers at the Samuel Rubin Foundation chose them to lead it. Sam was a Russian Bolshevik and his daughter Cora Weiss got involved with communists. Their original focus was shifting public attitudes and changing laws to their liking. Their war on Capitalism entails goals like putting the U.N. in control of American foreign policy. IPS allegedly wanted Obama to bypass Congress and issue Executive Orders. Which in itself people would see as an act of a tyrant rather than a President. Which is why we got things like the Tea Party for a few years. They call this technique “top down, bottom up.” Top down means getting people riled up for widespread chaos. Bottom up is using that chaos to make people believe they need change. The Washington Times reported Soros donated $33 million to groups working with Ferguson activists in 2015. That fuels the protest movement to extend itself for a longer duration of time than the story itself was. You can see how these 5 different dynamics start feeding into each other. There’s no need to further prove Bill/Hillary’s relationship with Soros. We can state their fondness for one another as fact. George went to bat for Hillary’s election as far back as October 2013. That’s when he donated $25,000 to become co-chair on the “Ready for Hillary” National Finance Committee. “His support for Ready for Hillary is an extension of his long held belief in the power of grassroots organizing,” said Soros political director Michael Vachon. Soros Fund Management spent $10,554,093 trying to get Hillary in office (via opensecrets.org). It’s definitely more than that for the election’s total. He didn’t put all his cash into just Hillary. Besides, $10 million is like pocket change to ol’ George. A Politico article from July 2016 takes a closer look at his 2016 Election funding. So here again we have an opportunity to see Soros up close and how he operates. By looking at how exactly he distributed his money during 2012, 2014, and 2016 election cycles. What differences do you see between these instances? What stays the same throughout? These are the sorts of questions worth asking, as you’ll see it’s a significant factor in how George Soros operates. $7 million to a super PAC supporting Clinton called Priorities USA Action. One of the largest in the Democratic Party. It came around to help Obama get re-elected. They ran a controversial and misleading ad about Mitt Romney closing down a factory. The ad insinuates it was Romney’s fault a factory worker’s wife died of cancer afterward. But according to a factcheck.org investigation, evidence points to that being untrue. $2 million to American Bridge 21st Century, an opposition research super PAC that has been targeting Trump and other Republican candidates. “Holding Republicans accountable” is their slogan. Enough said. According to Michael Vachon (political adviser for Soros), he told Politico more details: Soros committed $5 million to super PAC Immigrant Voters Win (dedicated to increasing turnout among Hispanics in swing states), another $5 million to “fighting conservative efforts to restrict voting,” (says Politico) called Voting Rights Trust (partly run by Clinton campaign lawyer). Finally, Vachon confirms $2 million to a voter mobilization group mentioned earlier, America Votes. Why bring this up? It’s a prime example of how George interacts with systems of government. It plays back into the shaping realities thing that Soros is into doing. George spent twice as much cash changing political landscapes compared to Hillary’s campaign. It reveals the true motivations on why Soros cares about migration. It’s all about getting them in voting booths. This was a big deal at the time. As Wikileaks documents show, Hillary and Soros were close. “Hi Huma (and Lona): It was wonderful to see you last week. Thanks so much again for making the time in a very, very busy week. Attached is an invitation for Secretary Clinton to join us at an evening reception at the home of George Soros in December. We would be thrilled to have her serve as honored guest and speaker at this gathering of our top supporters honoring America Votes’ work over the past 10 years and looking forward to the next decade. Thanks so much in advance for your and the Secretary’s consideration of this request. We are now holding dates at Mr. Soros’ home in the middle of the month (Dec. 15–17) and hope we can find a mutually agreeable date during that window if possible or an alternative. Please let us know if we can provide any further information, address any questions, etc. This is the only Wikileaks bit I’m going to go over in this piece. The chances of more examples somewhere in these messages are high, though. That particular exchange is an exception because of the media attention it received. The Women’s March on DC was a heavily Soros backed initiative, according to the Media Research Center. They made a list of every group that Soros donated to and calculated how much was donated between 2000–2014. Places at the top like ACLU got $37 million, and Planned Parenthood got $20 million. Further down there’s NAACP with $3.5 million. But it’s an interesting list overall as it shows the extent of George’s influence in American activism. Right now? We’ve got Antifa running around the country and causing a ruckus. This Steven Crowder video showing people what their movement is really like behind the scenes gives us a good idea of all that. People question if Soros is funding their efforts. They’re trying to make an election crisis to widen the political divide in the United States. Shout out to /pol/NewsInfinity for finding all this out. The guy that was running it got into some sort of rivalry with another Twitter named /pol/report. That particular account claimed to have information on Open Society funding Anti-fa groups. We won’t know what it was for sure since they vanished from Twitter before making any of their findings public. What resulted was /pol/NewsInfinity uncovered some things already in the public record. They posted a few situations pointing out a sort of connection between Soros and anti-fa. Unfortunately, their first example had some holes. Open Society gave a one-year grant to Washington Community Action Network for $50,000. All the way back in 2010. The Craigslist advertisement that Washington CAN puts up for anti-Trump organizers? Put up online in 2016. Soros could’ve funded Washington CAN. The fact money was exchanged at all is enough to consider it a possibility. But in this instance, the amount of time between point A and point B is too long to consider it feasible. 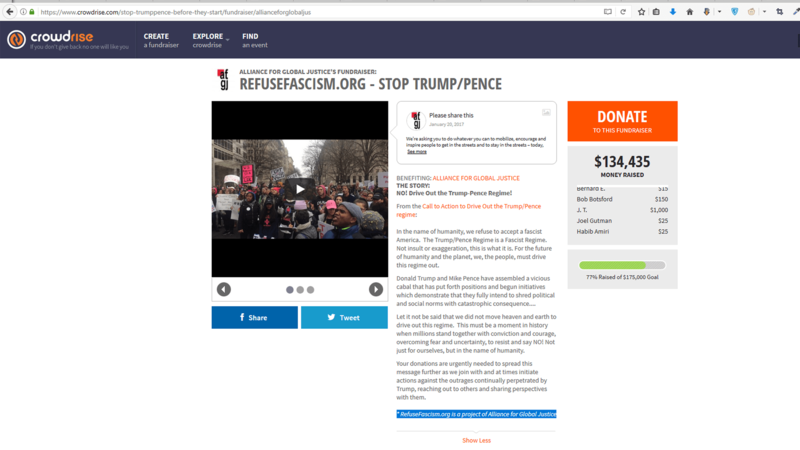 The RefuseFascism.org angle is more promising. On their crowdraise page, they disclose being an Alliance for Global Justice project. So boom right there you’ve got a lead. From that, all that’s needed is to look up their 990 tax forms (PDF) for 2016. You’ll see they list the Soros-linked Tides Foundation as a contributor. So the answer of “Does Soros fund Anti-fa?” is more of a yes than no. These days Soros is everywhere you look. Just recently there’s been a few prominent examples. In one corner we’ve got the United States. New reports indicate the NFL Player’s Association has donated to the same sorts of activist groups as Soros, like the Center for Community Change Action, the union group Jobs with Justice, and AFL-CIO’s Working America community affiliate. Over in the other corner, we have Europe. Specifically, Catalonia. After the recent clashes between Spanish police and Catalonia’s own authorities, and the violent protest riots that happened on Referendum day, reports surfaced revealing Soros helped fund some of Catalonia’s independence advocate organizations. $27049 to (Catalonia’s Public Diplomatic Council), and $24973 to the CIDOB — Barcelona international documentation and information center. U.S. government had a century and a half before Soros was even born to develop their institutions. Harder for Soros to infiltrate. In Europe, it’s different because George was around and in a place of power as the European Union was born. Next, we’ll go over how this works with the Open Society and what all this means.